Austin, TX (August 15, 2018): David Weekley Homes, the nation’s largest privately-held builder, hosted its fourth annual, companywide CA+RE School Supplies Drive in 17 cities across the country. 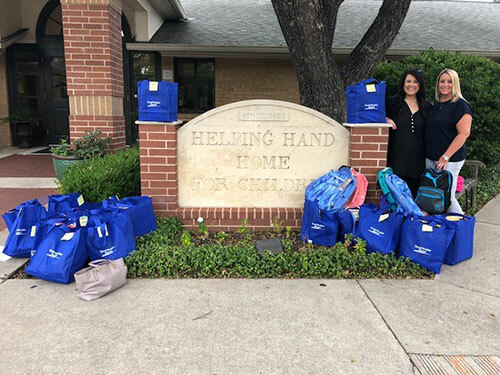 In Austin, school supplies were collected for Helping Hand Home For Children, an organization that helps severely abused children rebound from trauma and rediscover their childhood while also providing them with school supplies for a successful academic experience. Approximately $2,100 in supplies were collected from homeowners, vendors and David Weekley team members during the drive. This donation provided more than 44 students with the supplies needed for the school year. “The beginning of a new school year is such an exciting time, so the opportunity to provide the kids at Helping Hand Home For Children with brand new supplies is so rewarding,” said Mary Lewis, warranty coordinator for David Weekley Homes in Austin. David Weekley Team Members donated school supplies to Helping Hand Home For Children.